In Jambi’s history there is a legend of a woman with the name of Nyi Mas Rahima, or “Putri Ayu,” as she is commonly known today. On July 18th we wrote about the grave of Putri Ayu. Below is our translation of her legend. While reading, it must be remembered that this is a legend. Research has shown that information on the internet, as well as information gathered from interviews on the street are woefully inaccurate. C. speaking with men who were praying at the Grave of Putri Ayu. For example: a lot of information that is continually passed along is that this woman lived 500 years ago. Another account says 600 years ago. However, this legend takes place during the time of Dutch occupation, and specifically when hostilities were taking place. There were no Dutch hostilities taking place 500-600 years ago. According to historical documentation, she was the wife of Sultan Muhammad, who ruled the Jambi kingdom from 1812-1833 (that’s around 178 years ago). Many years ago in the Jambi Province there was a young beautiful girl named Putri Rahima. She was the only daughter of Kemas Mahmud, an honorable man that lived in that area. The beauty of Putri Rahima was like an angelic being. Besides her beauty, she also was blessed with a beautiful voice. She was known to have very good manners, both with her actions and her words. She was also gifted with the ability to cook, sew, weave, and embroider. All of these qualities caused this young lady to become the longed for ideal of every young man. The news about the beauty of Putri Rahima spread so much that she was known throughout the entire Jambi area. During that time period there was continual battles with the Dutch colonial powers that had dominated the people of Jambi. Even though many of the guerrilla soldiers were living deep in the jungles, the news of Putri Rahima reached even to them. The news about this beautiful young girl, with excellent character qualities, also reached the ears of Sultan Muhammad. Sultan Muhammad was a still a young man, very handsome, filled with honorable power and authority, and was well known as being devout, pious, and obedient toward his religion. The beauty of Putri Rahima so overwhelmed Sultan Muhammad that he immediately wanted to ask her to marry him. But following his customs, he returned to the palace and gathered several dignitaries from his kingdom and delegated them with the task of proposing to Putri Rahima’s father on his behalf. Mr. Kemas Mahmud responded that his family did indeed agree to the wedding proposal, and they were all in favor of it. The wedding plans could not be conducted according to the cultural norm because the war was still going on. A large wedding party would attract the attention of the Dutch colonialists, so the wedding ceremony was conducted in a quiet and secret manner. After the wedding Putri Rahima moved to the palace and had the title of “Nyi Mas Rahima.” The couple lived in harmony and mutually loved each other deeply. After two years Nyi Mas Rahima gave birth to a son whom they named Prince Adipati. The arrival of the son brought great happiness to Sultan Muhammad and Nyi Mas Rahima. The love Sultan Muhammad had for his wife continually grew, although in the middle of their happiness the war was still going on, and it continued to grow with intensity. As an honorable leader of their people, Sultan Muhammad sensed his great need to defend their land. Sultan Muhammad frequently left the palace to actively be involved in the war against the Dutch colonialists. Due to his absences, he wasn’t able to give attention to his family as he would have liked. Fortunately for him Nyi Mas Rahima was a wise mother. She always gave their son the attention required. Prince Adipati grew strong and became very understanding about the war that his father had to be involved with. One day Nyi Mas Rahima said to Prince Adipati” “My son, your father is a soldier, that is the reason he always leaves us. He has a responsibility to defend our land.” Statements like that were continually made to Prince Adipati by his mother every time Sultan Muhammad left the palace. During this time the Dutch military were increasing their activity. They continued to spread their authority and control over larger and larger areas of Jambi, until almost the entire area was subdued. They had even built a fortress close to the palace. This situation caused Nyi Mas Rahima to become increasingly concerned. On top of all that, she was also expecting their second child. 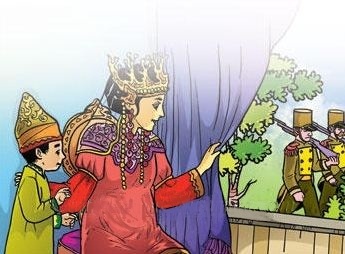 Putri Ayu and her son, Prince Adipati, observing the Dutch soldiers patrolling outside the palace window. When Sultan Muhammad would leave the palace the Dutch soldiers would frequently roam the area outside the palace. This caused Nyi Mas Rahima to feel that the security and future of Jambi was in great jeopardy. She was carrying a tremendous load of stress because of her concerns for the safety of her husband, and that of her people’s freedom. The child within her was growing rapidly, but she was becoming weaker and weaker, and was frequently sick. Finally her body and spirit could no longer take the stress and she passed away, before she was able to give birth. The death of Nyi Mas Rahima brought great grief and sadness to Prince Adipati, especially because his father still had not heard the news of his mother’s death. Because Nyi Mas Rahima was so friendly, loving, and always supportive of her husband during the war, the families living in the palace erected a beautiful gravesite as a memorial to her. After it was built they diligently maintained it to keep the memory of her alive, as well as to honor the values she demonstrated as an example to all who came after her. Due to the continual threat from the Dutch fortification outside the palace, the families living in the palace decided to flee into the jungle where they could find security. One evening, when it was very dark, the families secretly fled the palace, taking Prince Adipati with them. The next day the Dutch soldiers immediately took possession of the palace, which they found had been vacated the night before. When they entered they were startled to see a beautiful and well maintained tomb. The Dutch soldiers began to ask: “Hey, whose grave is this? It has been decorated very beautifully and maintained with diligence.” Their thoughts were that it couldn’t be just some ordinary person. It had to be someone of special importance. The curiosity of the Dutch soldiers led them to begin questioning the Jambi citizens who were still living in the area. At that time the Dutch soldiers named the grave of Nyi Mas Rahima “Makam Putri Ayu,” which means, the grave of the beautiful princess. Until this present time, the beauty and cleanliness of the grave of Nyi Mas Rahima (Makam Putri Ayu) has been maintained and guarded. The walls are very nicely painted and it has a corrugated metal roof. The original tombstone is no longer legible, if indeed anything ever was written on it. Originally the grave of Putri Ayu was located just south of the former Dutch water tower, with the name of “PDAM Tirta Mayang.” Due to the need to widen the road at the location where the original grave of Putri Ayu was located, the remains were said to have been moved to a graveyard located on Kemboja Street in 1980. A satellite view of the location of her former grave can be found by clicking this link. The satellite view of her grave’s current location can be found by clicking this link.